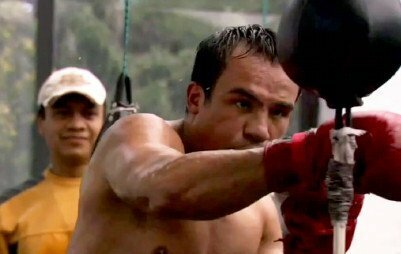 By Bill Phanco: Former four division world champion Juan Manuel Marquez (55-6-1, 40 KO’s) has decided to continue fighting after meeting with his wife and children to help him make the decision, according to fightnews.com. Marquez, 39, wasn’t sure whether he should continue his 20-year pro career after knocking his old nemesis Manny Pacquiao out in the 6th round last month in their fourth fight. But the lure of big money in a fifth fight with Pacquiao proved to be too much for Marquez, and he went with what many boxing fans would agree is the smart choice by continuing to fight at least for the remainder of 2013. Marquez made $3 million guaranteed for the fourth fight with Pacquiao, and he should make considerably more next time around. Bob Arum of Top Rank is targeting September as the month that he’d like to put Pacquiao and Marquez back together again. However, if they choose September 14th it might hurt the pay per view numbers because Floyd Mayweather Jr. and Saul “Canelo” Alvarez are scheduled to be fighting on that date, possibly against each other. It would be a disaster for all if Arum decides to put the Pacquiao-Marquez 5th fight on the same date. It might be a wiser move to move the fight to a different month altogether because a lot of boxing fans won’t be eager to pay for two big money PPV bouts in the same month. It will drive their cable bills to well over $100 just for the fights alone. Having the fight take place in August or October would be a much better idea if Arum wants to maximize revenue. There’s a possibility the Pacquiao vs. Marquez fight could take place in Texas at the Cowboys stadium, although it’s still way too premature to speculate on the venue at this point. Pacquiao and Marquez still have tune-up fights in April they have to get past before any serious talk about a rematch, money and venues can be discussed. Unbeaten welterweight contender Jessie Vargas has been mentioned as a possible opponent for Marquez. Vargas is a Top Rank fighter, and Marquez would be doing Arum a HUGE favor by fighting Vargas and helping to make a name for him. Marquez really needs a southpaw around the same height as Pacquiao to fight in a tune-up rather than the 5’10” Vargas, who is nothing like Pacquiao in size, power or fighting style.